In order to avoid pinching on St. Patrick’s Day, you’re supposed to wear green at school, the office, or the horribly overcrowded faux-Irish pub you find yourself in. But at the race track, it’s historically been best to take the pinch—the color green has long been a sign of bad luck in racing, for an old and strange reason. While it originated long before NASCAR did, the “green superstition” gained a stronger hold in those ranks than elsewhere. It hung around well into the 1980s, but the series is mostly over the supernatural powers of the color these days. But the color is a relatively recent adoption into NASCAR. Though no one is completely sure how the the superstition began, its roots arguably date back to two crashes that occurred a decade apart from each other—one in 1910 and the next in 1920. The first event involved the green car of Lee Oldfield, when a wreck at the 1910 New York State Fair in Syracuse landed him in the grandstands. The incident killed several spectators, according to NASCAR.com, leading Oldfield himself to believe that he was the source of the superstition. If that wreck was the official beginning of the superstition, it just got stronger 10 years later. Gaston Chevrolet, race driver and younger brother of Chevrolet Motor Car Company co-founder Louis Chevrolet, entered a race scheduled for Nov. 25, 1920 at Beverly Hills Speedway, a board track in California. The Beverly Hills Speedway murderdome was just over a mile in length, making for fast and close racing. While trying to make a pass on lap 146 of a race there, Wired writes that the green car Chevrolet drove made contact with a competitor and shot up the ramp. The two-car wreck killed three people: Chevrolet, fellow racer Eddie O’Donnell and O’Donnell’s riding mechanic, Lyall Jolls. And so the superstition went on. Avoidance of green cars in racing peaked between the 1920s and the 1950s, mostly because it was easier to do back then. As sponsorship of cars became more prevalent throughout various racing series in the 1970s and 1980s, racers had to begin ridding themselves of their feelings toward the color. But Formula One drivers had to get over the superstition long before the series introduced the era of car sponsorship in 1968, as paint colors represented driver nationalities. The British had the “unlucky” draw of green during that era. Crawford’s grandfather wasn’t the only one who took the green avoidance so seriously. Even with sponsorship money involved in the matter, NASCAR drivers like Tim Richmond still stayed true to their superstitions. According to Sports Illustrated, Richmond remained adamant in his quest to keep green off of his car throughout the 1980s. Richmond insisted that rather than driving the green paint scheme of Folgers decaffeinated coffee, he would instead get behind the wheel of a car coated in the red hue associated with the brand. Other than Richmond, the 1980s ended up being a good era for the color green in NASCAR. Darrell Waltrip took home 12 race wins and the 1981 NASCAR Cup Series title with a green Mountain Dew car, further ushering out the sour feelings toward the color at the race track. Of course, none of that means today’s drivers believe green cars to be unlucky. Jeff Gordon admits to being familiar with the superstition “until I had a race car that had green on it, and I won a lot with it,” he said, referring to his famous No. 24, which won four titles in a DuPont scheme that featured rainbow stripes. And last year, NASCAR Sprint Cup Series driver Kyle Busch pulled a green car into victory lane at Homestead-Miami Speedway to celebrate both a race win and one of the most unexplainable comebacks in the sport’s history—missing 11 races due to broken leg and foot sustained a crash prior to the 2015 Daytona 500, only to come back and win the championship under the series’ new rules. These days, perhaps it’s not such bad luck to wear green around the garages. In retrospect, the superstition hung probably around for a few decades too long. 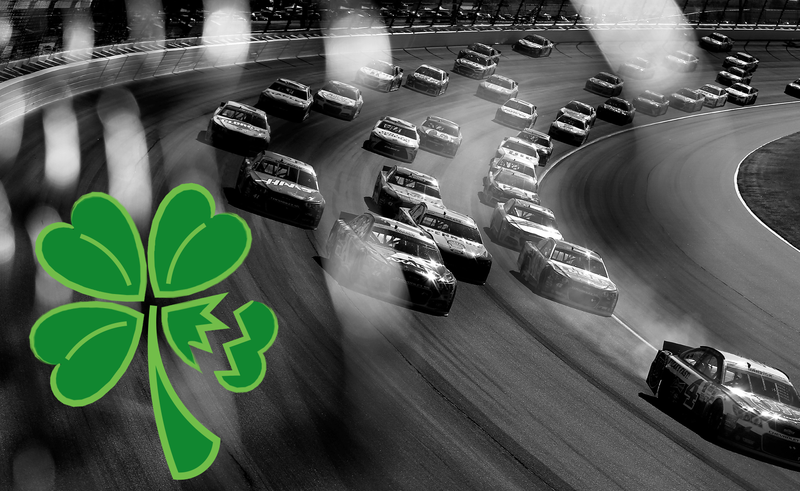 But don’t hold it against the NASCAR folks for holding onto that weird green superstition a bit longer than the rest of the racing world did—odds are, you still look for four-leaf clovers on occasion.